Chapman’s Sectional Map of Wisconsin. This is an extremely rare and unusual 1856 pocket map of Wisconsin by Silas Chapman. Chapman appears to have published two maps pocket maps of Wisconsin in 1856, this map, delineating the entire state, and a another smaller map showing only the surveyed portions (bottom 2/3rd) of the state. This larger map is by far the rarer of the two. Consists of the entire state bounded on the north by Lake Superior, on the East by Lake Michigan, and on the west by Minnesota Territory. The copyright data at the bottom of the map has a date of 1855, but below the title an 1856 date appears. Our research shows no evidence an 1855 version of this map actually being printed. Chapman did issue a smaller version of his Wisconsin map in the 1855 'Traveler's and Immigrants Guide,' but there seems to have been no independent issue of a Sectional Map of Wisconsin of this size and form until 1856. The coloration of this map, with light red outlines defining the counties and the state itself outlined in blue, is very similar to that which appears in the map issued with the 'Traveler's and Immigrants Guide,' but is quite different from other versions of this map also dated 1856. Nor is the red linen binder similar to other 1856 issues which used green linen. 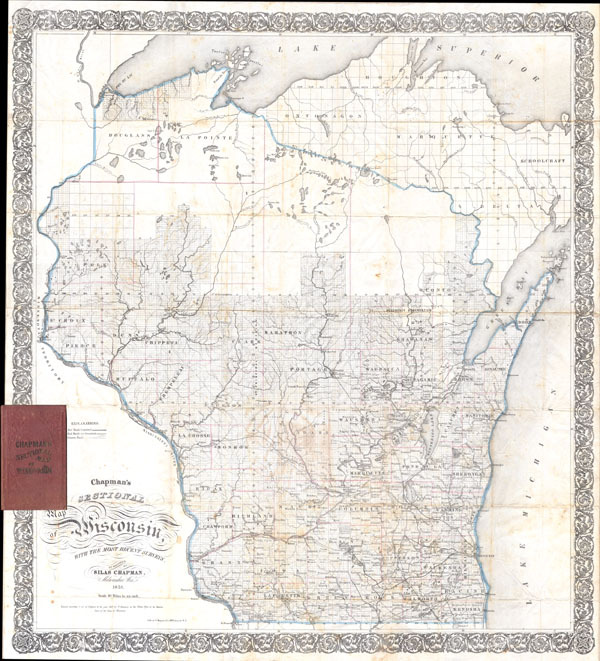 This leads us to believe that this map is in fact a very early 1856 printing, most probably a first state and first edition, of this important Wisconsin map. Depicts the state of Wisconsin in considerable detail especially in the surveyed portions of the state. Notes several American Indian reservations include the Menomnee Reservation and the Oneida Reservation. Includes town, cities and smaller settlements, saw mills, rapids, waterfalls, roads, creeks, lakes, forts, and rivers. This map also notes the site near Praire du Sac where the Black Hawk War's Battle of Wisconsin Heights was fought. In this historic last stand, a mere 60 Sauk warriors held off over 700 U.S. regulars and militia under the command of Henry Dodge while the Indian women and children crossed the river to safety. At dawn the Sauk chief Neapope, concealed in a tree, verbally offered to negotiate surrender. The U.S. soldiers, lacking an interpreter, ignored his plea. Further east, along the Mississippi, the map also shows the site of the Massacre of Bad Axe. Fleeing the aftermath of the Battle of Wisconsin Heights the remaining Sauk, mostly women and children, were cornered against the Mississippi River and slaughtered. Silas Chapman (June 9, 1813 - December 14, 1899) was active publisher of Midwest maps from roughly 1850 to the mid-1870s. Chapman was born in Southampton, Massachusetts and as a young Man attended New York University. In 1841 he moved to Prairieville (Waukesha) Wisconsin where he worked in academia as a local principle then as a schoolmaster in Milwaukee. Around 1843 his turned his attentions to publishing and briefly partnered with printer Philetus C. Hale until striking out independently in 1850. It was in this period - post 1850 - that his most important maps were published. From roughly 1850 to 1870, Chapman published a series of important wall and pocket format maps of the Midwest focusing specifically on the states of Michigan, Minnesota, Iowa, Minnesota and Illinois. Upon his retirement the Chapman firm was acquired by Dyer and Pasmore, who continued to update and republish his maps into the 1880s. Very good. Generally very good condition. Some browning and creasing along original folds, especially at intersections where there are few minor separations. Verso repairs here and there. Minor browning at bottom center. Detached from original red linen binder, which is included.